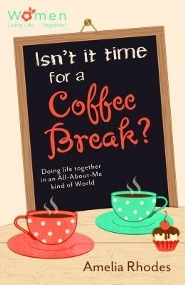 Little Writer Momma: Isn't it time for a Coffee Break? In the midst of our hectic lives (that seem to move at a quicker clip with the addition of each child!) it seems easy to find excuses for why we can't engage with others in more meaningful ways and on a more regular basis. I know this reality all too well. I've been meaning to invite several of my neighbors over for a potluck for over a year now! Scott and I regularly talk about other young families in the church we'd like to get to know better and how we should have them over for dinner...we have the same conversation every six months or so and never make plans! There are women in my MOPS group that I'd love to host for a playdate for or invite out to coffee...but alas, life seems to perpetually get in the way! That is why this book, Isn't it Time for a Coffee Break? Doing Life Together in an All-About-Me Kind of World (great title, isn't it?!) by Amelia Rhodes is so important and wonderfully convicting to read. It is relatively short and easy to read (quite suited for us busy women! ), but FULL of insight, wisdom and encouragement. It was a much needed reminder that when we don't make the time to connect with others we are missing out on some of life's most important ingredients...fellowship, friendship and community. Amelia happens to be a friend, which is the other reason I'm SO excited about this book (her first!). The beautiful irony is that a connection that started on whim when we were standing in an author line to get books signed at a writing conference grew into something deeper over time-- first through our online Facebook relationship (yes, Facebook does have some virtues!) and then when she so graciously invited me to stay at her house for four nights at that same conference two years after our first meeting! Amelia did not just write a book about doing life together because it seemed like a worthwhile topic (which it is! ), but because it is something that she strives to authentically do in her own life on her own and with her family. Even funnier is that my short stay at her house ended up offering a humorous anecdote included in her chapter on Hospitality (yes, I have a short cameo in the book!) when, after all of her thoughtful and intentional preparations, her feisty cat continuously decided to paw it's way through my suitcase and jump onto the table looking for leftovers while I was eating breakfast...she muses that no matter how much preparation you put into preparing for these things there are often details we cannot predict! In her introduction Amelia says, "God did not design us to live our lives alone. In a world increasingly busy and focused on self, doing life together as God intended sometimes seems as impossible as getting chewing gum out of a child's hair. We can have a thousand "friends" online, yet no one to call up and share our hearts with over a cup of coffee." The book is broken down into six chapters each highlighting an essential "ingredient" for friendship and connection; Love, Generosity, Hospitality, Forgiveness, Unity and the creative acronym H.E.L.P (Honesty, Encouragement, Love and Prayer...the essentials to a good friendship). Woven creatively throughout the book is a well crafted coffee metaphor, many relatable life examples, appropriate and well chosen scripture references and well written discussion questions which lend this book to being great for a small group study. "As we purify our relationships with each other through a double filter of love for God and love for each other, we find our differences and divisions are screened out leaving Christ at the center of our lives together." "If we can truly grasp what it means to love each other and inspire each other to fully develop and utilize our gifts within the body, the world would be a different place. We'd have love instead of lines drawn in the sand. We'd have a beautiful body instead of one bruised by each other. We'd have the world's attention." Loved those quotes and the whole premise of the book. Go Amelia!